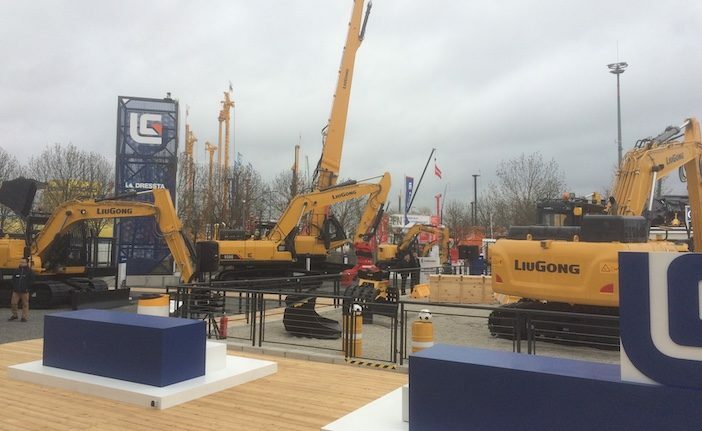 Chinese OEM LiuGong is using Bauma Munich this week (April 8-14) to set out its growth vision for the next six years, aiming to break into the top three construction vehicle OEMs in Germany and the top 10 in the world by 2025. 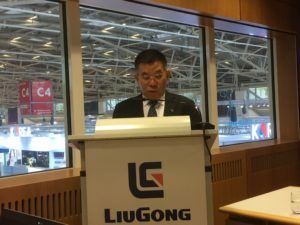 Speaking at a press conference yesterday (April 8) Zeng Guang’an, chairman of LiuGong Group (below), spoke proudly of the company’s achievements over its 60 year history, overcoming the challenges of changing markets, trade barriers and fierce competition. “Change is happening fast especially in Germany through trends like electrification and digitization,” continued Zeng Guang’an. “That’s why we are significantly increasing investment in R&D, so we are ready to capitalize on opportunities for the transformation of business in the age of intelligent automation. We have a vision for 2025 – to develop cutting-edge technologies to upgrade intelligence. We want to be in the top three in Germany and top 10 globally by 2025.” LiuGong are currently ranked 21 globally in construction vehicle OEMs. 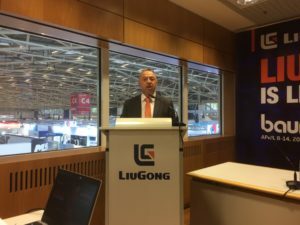 LiuGong Europe chairman Howard Dale went on to highlight key areas of investment – European manufacturing and R&D (particularly through new facilities in Poland); parts distribution; a new European HQ; and recruitment. As part of this ongoing investment Dale also announced that LiuGong has acquired CPMS – which becomes a new LiuGong dealer for England, Wales and Scotland, and will create five new LiuGong branches and national distribution in the key UK market. Dale also drew attention to the new LiuGong machines making their debut at Bauma, including the new 909 ECRX excavator, with greater visibility and improved tool handling capability; the 950E high-reach excavator, designed for the demolition industry; the 4180D grader, which recently won a Red Dot design award, partly thanks to its industry leading 324° visibility range from the cab; and new TD-15 and TD-25 dozers, which have pressurized cabins, 30% more glass on their windshields and new, rearview cameras. The full new machine line-up was announced earlier in the year.